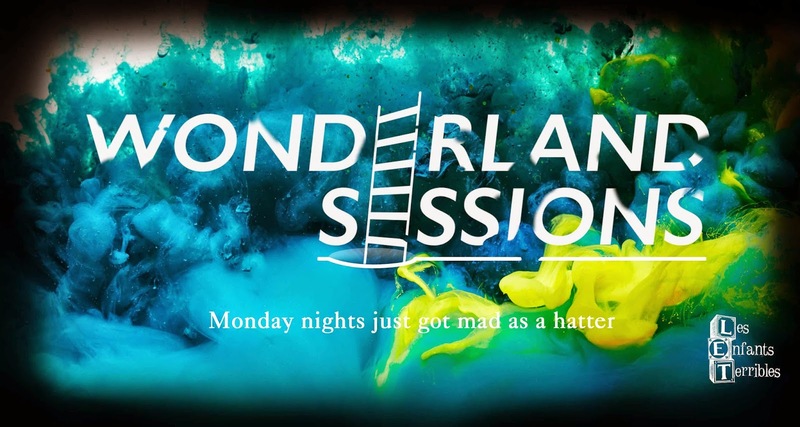 Last night I fell back down the rabbit hole, and into one of the weekly Wonderland Sessions on at The Vaults as part of Alice's Adventures Underground. This weeks theme - Reinventing Alice, something which I was really looking forward to as the ways in which you can take something and develop it in your own artistic means are endless! There's also been a fresh wave of taking classic literature and adapting it in exciting new ways with shows like A street Car Named Desire recently performed as a ballet. Indeed Alice herself has been turned into an Opera previously, and the scope here is as large as any. You only need to look around you to see how ingrained Alice is in our culture. So it was great to see the way in which artists were reinterpreting Alice through their own formats; from ballet to songwriting, painting, poetry and lighting it was a great eclectic mix of inspiration. Danilo Dj Wade (@deejwalde) that was positively haunting, especially when accompanied by a ballet piece choreographed by Jenna Lee (@Jlee_production) and danced by Amy Hollins as Alice ( @HollinsAmy ). In this we also had Walkabout Projections by Prickimage ( @PRICKIMAGE), which combined, was a fantastic creative mix of all the elements that made up Alice's journey. Walkabout Projections was also a fantastic concept to bring light and imagery to a show, and I loved how it allowed the show to move around the space and become part of the characters performance. I also loved the different styles of dance that were included and intertwined, from Alice, to the contemporary styles of the Dormouse by Louis McMiller (@TheRealMcMiller) and the hip hop flare of Breakz Samuel's White Rabbit....the latter which was accompanied by Grace Savage's ( @_GraceSavage) beat boxing. DAMN! The things that girl can do with her mouth! Luck Wright ( @lukewrightpoet ) changed things up with two poems, one, 'Alice' which was specifically commissioned for the event. I enjoyed the way his poetry flowed and how Alice was brought in to the 21st century, yet there were still lots of nods and allusions to the original body of work. The repetitions of 'Late. Late. Late' really adding a pace and intensity to his voice that brought me back to the story yet here i was in a modern setting. I also loved how his first poem 'The Ballard of Edward Dando' was based on the true story of a hatters apprentice and took the form of a Georgian Ballard, the traditional way in which news was passed about in this era. You can listen to it in all its glory here. One of my highlights of the evening was Jon Hicks, performance painter. When I heard this was happening I was a little like.... ok?...then it started and I was still a little .... BUT then when you saw the piece coming together and the fluid way we worked, slopping paint onto the canvas that one second went from a line to a distinctive feature of someone's face was fantastic! The resulting piece was amazing (you can see it's amazingness below) AND I WANT IT! WHERE CAN I GET IT! WHOSE HEAD NEEDS CHOPPING OFF! We also had some great musical accompaniment from two of the performers of the show Haley Harland ( @HayleyHarland ) who is the six of clubs and Alexander Wolfe ( @AlexanderWolfe) (who you can sort of maybe see below) who is the mock turtle, and performed a song ' The Mirror and the moon' which was specifically created for Alice's Adventures Underground. It was a beautiful song that makes me want to go back and see the show just to hear him sing it again! This was a great session and there is still some great talks to come with themes looking at how Alice still continues to inspire writers and how they went about building the set. So make sure you get down to one if you can....I'm mean next week they've got CATHY CASSIDY who has written a modern take on Alice!!!! No biggie or anything! Also make sure you check out our review of Alice's Adventurs underground here and then go and see the show, I can't wait to go back! !